Just days before the trailer is set to debut at Comic-Con, Warner Bros. has unveiled the first Aquaman poster. 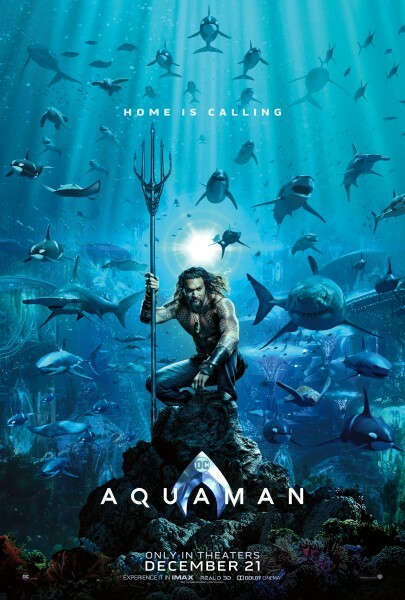 It features star Jason Momoa as the aquatic DC Comics hero, underwater rocking a pair of leathre pants and surrounded by fish, sharks, dolphins, oh my! Directed by James Wan, the film is being described as a swashbuckling Romancing the Stone-style adventure, much lighter in tone than others in the DCEU. This is an important film as Warner Bros. tries to bounce back from the embarrassing failure of Justice League, and Comic-Con should be a good barometer for how they are doing. Aquaman opens December 21st and co-stars Amber Heard, Patrick Wilson, Nicole Kidman, Willem Dafoe, Yahya Abdul-Mateen II, Dolph Lundgren, and Temuera Morrison.